Now it’s home to Tiger, a pit bull terrier rescued from a dog fighting ring, and a bunch of other dogs who need some extra love and care. MASH runs a program that allows inmates at a prison to care for dogs rescued from abuse, providing them with the comfort they need to learn to trust people again. 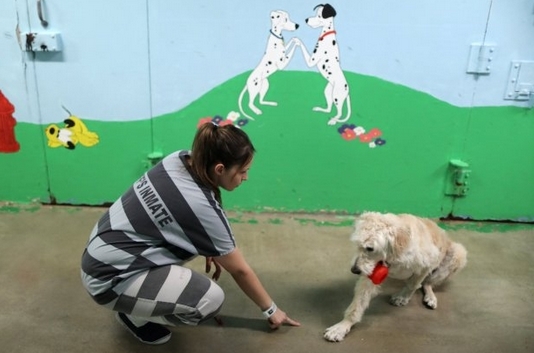 It’s a great program for the dogs, obviously, who’ve been moved from awful conditions to the shelter, but for the inmates, too, who get the joy of time spent with a bunch of pups. Six days a week women at the prison are moved to the shelter as part of the 30 day program. Since 2000, the shelter’s provided a place where dogs, cats, and horses can be cared for until they’re ready to move to a permanent home, and where inmates can get some much needed interaction with animals. Volunteers investigate complaints of animal cruelty, go in and rescue the animals, and then bring them back to the shelter where they can recover. 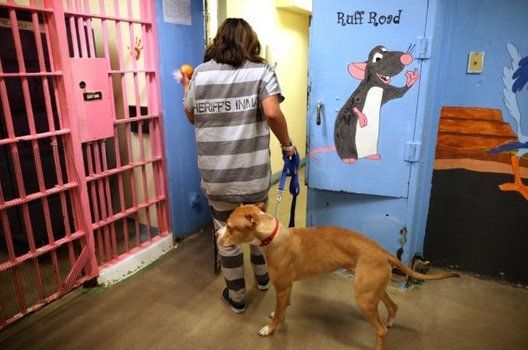 The cells have been converted into mini rooms for the dogs, and have been renamed Bow Wow Way, Purr Lane, 2nd Chance, and Ruff Road. Lovely. ‘I get so much out of it, probably more than the dogs do,’ Kristina Hazelett, one of the women in the program, told REUTERS. Kristina, along with the other women in the program, had to go through rigorous interviews and screenings before they were allowed to start looking after the dogs. Responses to "Former jail is now an animal shelter where prisoners look after rescued animals"
This is a wonderful idea,thank you ! !